Do you want to develop and realise a customized solution with us? Reduced time and costs: Simple integration into Siemens’ world of automation facilitates installation, start-up and parameterisation, thereby saving time and costs. Increased plant availability: The integrated P-channel shutoff (hot-swap function) enables a valve change during operation. More process and operational reliability: By using the EVS function, individual safe emergency off circuits can be implemented on the valve island with very little effort. Fast certification: The necessary documentation for plant approval was submitted quickly. Intelligent automation systems offer practical diagnostic and safety-related shutdown functions. Preventive maintenance measures are also possible and integration into the world of process controls can be implemented “seamlessly”. Pneumatic automation is based upon high performance valve islands. In a fermentation plant for insulin production of the ZETA Group, twenty Bürkert valve islands are responsible for electro-pneumatic automation and control about 600 valve functions during the fermentation process. Insulin has revolutionised the treatment of diabetes mellitus. This life-saving agent has been produced industrially with the help of genetically manipulated bacteria and yeasts for more than twenty-five years. Stringent demands are placed on the applied process technology. The plants therefore need to not only meet strict hygiene and cleaning standards and legal requirements but must also operate at the highest levels of precision and reliability. The ZETA Group, headquartered in Austria, is a specialist for tailored process solutions for such sterile and aseptic applications. ZETA supplies a fermentation plant, including automation technology, for insulin production. The project incorporates designing, installing, testing and certifying eighteen tanks, thirty control cabinets and the complete measurement and control technology. 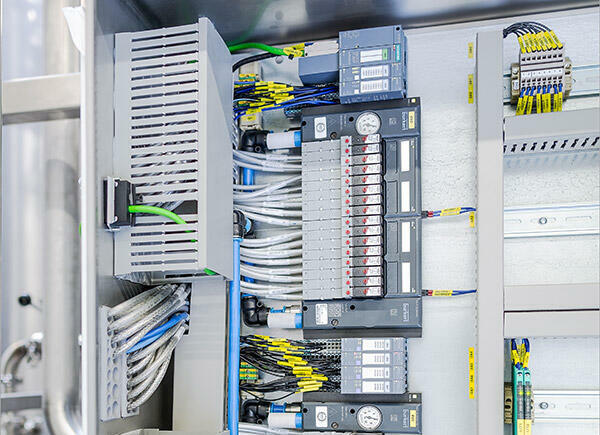 A total of twenty Bürkert valve islands (Type 8647) in combination with the distributed I/O system ET 200SP from Siemens, which control around 600 valve functions during the fermentation process, are used for electro-pneumatic automation. The valve island Type 8647 is designed for installation in control cabinets and can be mounted on standard rails to save space. There were several reasons for choosing the new valve terminal generation, as Andreas Rauscheder, Project Engineer at ZETA, explains: “The hardware and software integration into our world of automation from Siemens has simplified installation, start-up and parameterisation. Parameterising the valve island via HPS file in the Siemens TIA portal helped us save significantly on time and costs.” Another key advantage of the system is the external valve voltage shutdown (EVS), which ensures greater process and operational reliability. The EVS function interrupts the supply circuit for the load voltage of the valves via a potential-free contact. This enables safe shutdown of individual valve modules in accordance with the requirements of the Machinery Directive and EN13849 or the corresponding SIL requirements. Individual safe emergency off circuits can thus be implemented on the valve island with very little effort. The diagnostic function integrated as standard offers further options for increasing operational reliability in addition to the display and forwarding of the EVS function. An integrated pressure measurement module monitors the supply pressure and transmits warning and error messages to the control level in the event of deviations. Switching cycle counters can also be used independently of each other for the pilot valves and the downstream actuators. In addition, an integrated software function allows the switch position of the process valve to be shown directly on the display of the valve island. Wire break, short circuit and open valve outputs are also detected, displayed on the valve island and forwarded via the communication interface of the ET200SP. To increase pneumatic availability and ensure plant availability, ZETA opted in favour of the integrated P-channel shutoff (hot-swap function). This enables a valve change during operation without having to depressurise the entire valve island. The integrated check valves in the exhaust air ducts of the valve island ensure reaction-free and safe switching of the process actuators. Since the fermentation plant is intended for the Russian market, the EAC certificate of the Eurasian Economic Union was also required for the valve islands. Bürkert responded and was able to present the relevant documents quickly. All other cooperation went smoothly without any problems as well: “The delivery deadlines were adhered to exactly, the advice was spot on and minor software adjustments that were subsequently required were implemented quickly,” adds the project manager.